Happy New Year!!! Welcome to my first post of 2016! That's exciting enough in itself but it also means that we're only a few days away from Sale-a-bration and purchasing from the new Occasions Catalogue! Yay! Remember, from 5th January to 31st March you can choose one FREE Sale-a-bration item for every $90 you spend! A get well card suitable for a sick male! One of our friends is spending New Year in hospital so I made this card to cheer him up a bit. 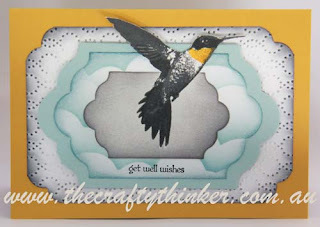 I've used the bird from the Picture Perfect stamp set (140520) in the new Occasions Catalogue. This set represents great value with 18 photopolymer stamps in the set! It's also very versatile since it includes a two-step star fish, a three-step flower and this four-step bird. Yes, that's right - this is a four-step stamp! I must admit that I was at first a little intimidated by that - but once I inked up the stamps I found it very easy to use and it gives a beautiful effect. The possibilities are endless with colour combinations! This one used Smoky Slate, Basic Grey and Crushed Curry inks. I wanted the bird to be breaking free so I used the out of the box technique for die cutting, masked the bird and sponged with Smoky Slate. I then cut a larger piece with the Lots of Labels dies and used a mask to sponge on clouds with Soft Sky and Marina Mist ink. The last of the Lots of Labels layers was cut from Soft Sky cardstock. The next layer is whisper white cardstock. 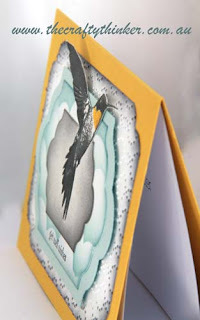 I embossed it with the ElegantDots embossing folder, punched the corners with the Curvy Cornere Trio Punch (139683 in the Occasions Catalogue) and sponged the edges with Smoky Slate and Basic Grey inks before adhering it to the Crushed Curry card. 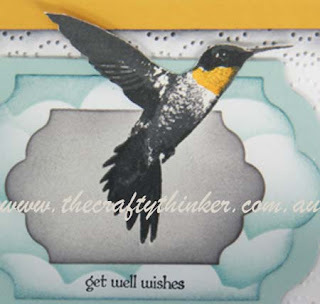 The sentiment is from Teeny Tiny Sentiments, stamped in Basic Black ink. To give the bird a bit of lift (sorry - couldn't help myself! ), I popped the Soft Sky layer up on dimensionals. I hope you like this card - please leave a comment!